Published graphic materials for the Beinecke Library which receive original cataloging are cataloged according to the latest full national standards for descriptive cataloging. 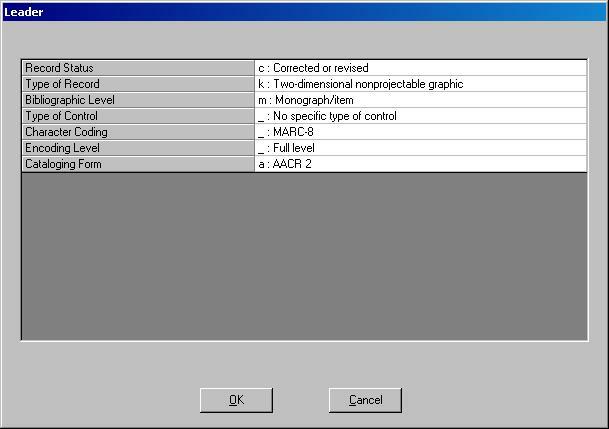 The national standards are set forth in Graphic Materials: Rules for Describing Original Items and Historical Collections (1982 printing with updates) and the latest revision of Anglo-American Cataloguing Rules, 2nd ed., commonly known as AACR2, as interpreted by the Library of Congress rule interpretations. The latest editions of AACR2, the Library of Congress rule interpretations and the Graphic Materials cataloging manual are all available through Cataloger's Desktop. A word about the differences between Chapter 8 of AACR2, also called Graphic Materials, and Graphic Materials, the cataloging manual: in the words of the manual, Chapter 8 focuses on “commercially-produced audiovisual materials, published and/or documented artists’ prints and photographs, portfolios and reproductions accompanied by printed information.” The Graphic Materials cataloging manual, however, “not only augments the original rules found in Chapter 8, but it also departs from that base in several instances in an effort to meet the requirements for cataloging original and historical graphic materials” so Graphic Materials: Rules for Describing Original Items and Historical Collections is the Rare Book Team’s default cataloging manual. Graphic Materials includes, among other things, a glossary, examples of catalog records (some with illustrations of the works cataloged), a concordance matching up Graphic Materials rules and MARC 21 fields (clickable, of course, in the online version) and examples of MARC records for graphic materials. The main differences between a MARC record for graphic materials and MARC records for other formats are to be found in the leader, the 007 and the 008 of the fixed, or variable control, fields and, among the variable data fields, in the 040, the 245 and the 300. 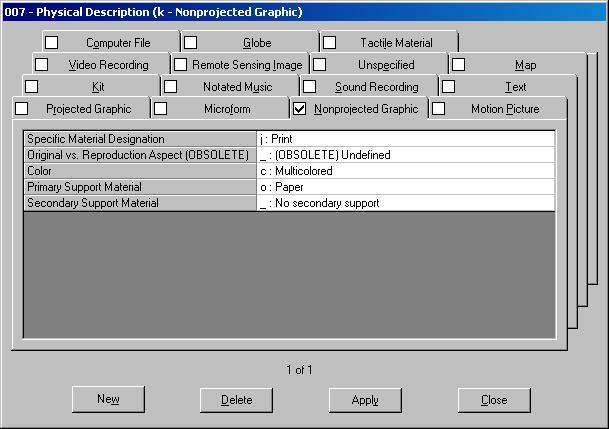 The 007 field is utilized and Nonprojected Graphic is checked and filled in to provide information on: Specific Material Designation, Color, Primary Support Material (and, if applicable, Secondary Support Material). The 040 field contains the subfield e with the cataloging source code: gihc. The 245 field may contain the GMD (general material designation), “graphic”, in a subfield h immediately following the subfield a. The word ‘graphic’ is always bracketed. The use of the GMD is optional but the Rare Book Team will use it. 245 1 4 ‡a The drummer boy of our regiment ‡h [graphic] : ‡b eight war scenes. 300 ‡a 1 print : ‡b silkscreen, printed in black ; ‡c image 58 x 54 cm., on sheet 78 x 57 cm. 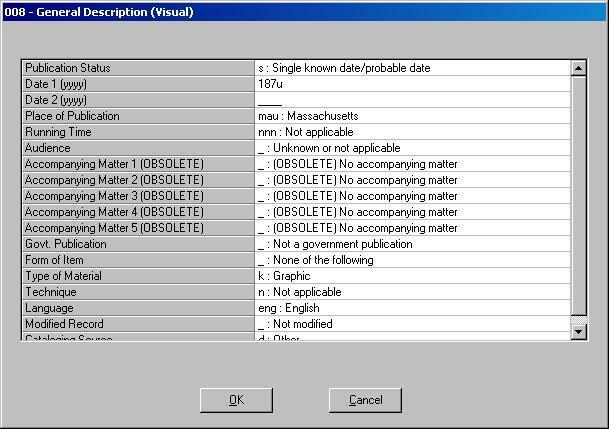 The 520 field is often used to describe the visual details of the image[s] being cataloged. 520 ‡a A cupid is pictured sitting on a wall, opening the door of a wooden cage and releasing a flock of doves into the air; each dove flies away to deliver the envelope it carries on a ribbon around its neck. Copy specific notes are made to record important information pertaining to individual copies but not to all copies. This information is often noted on the accompanying accessions slip. Information about provenance evidence, imperfections, and bindings (including bound-with information) pertaining to the copy in hand but not to all copies is recorded in copy specific notes. 590 ‡a BEIN Zc56 893ra: Autograph and manuscript notes of Herbert Thomas Ackcoll. Original wrappers. Following is a list of notes. Use as appropriate. Some may never be used. All name and title access points required by the latest national standards are made. Additional name access points may be made to bring out contributors and contents of the item which are deemed important to the collections being cataloged. Generous title access and access for illustrators, engravers, and on occasion, printers and publishers, is made. 650 0 ‡a [Subject] ‡v Pictorial works. 651 0 ‡a [Geographical subject heading] ‡v Pictorial works. 650 0 ‡a Gypsies ‡v Pictorial works. 651 0 ‡a Cincinnati (Ohio) ‡v Pictorial works. There are several standard thesauri that can be used for graphic material. All of these can be, and have been used, in Yale catalog records. "The AAT is a structured vocabulary currently containing around 131,000 terms and other information about concepts. Terms in AAT may be used to describe art, architecture, decorative arts, material culture, and archival materials … Terms for any concept may include the plural form of the term, singular form, natural order, inverted order, spelling variants, various forms of speech, and synonyms that have various etymological roots. Among these terms, one is flagged as the preferred term, or descriptor. " In cataloging graphic materials, TGM will be the default thesaurus for form/genre terms. If a needed term is not found in TGM, a term from AAT can be used, if one exists. We will use TGM for subject access only in extraordinary circumstances. 100 1 ‡a Emmert, Paul. 245 1 0 ‡a View of Honolulu ‡h [graphic] / ‡c drawn on stone by G.H. Burgess ; sketched from nature by Paul Emmert. 300 ‡a 6 prints : ‡b lithograph, b&w ; ‡c 63 x 88 cm. 590 ‡a BEIN 2003 Folio 93: Bookplate of Paul Mellon. 500 ‡a Statements of responsibility from no. 1; date from nos. 2-6. 500 ‡a Lithographs printed in black on a pale tan-colored ground; white highlights. 505 1 ‡a no. 1. From the harbor -- no. 2. From the Catholic church -- no. 3. From the Catholic church -- no. 4. From the Catholic church -- no. 5. From the Catholic church -- no. 6. From the Catholic church. 651 0 ‡a Honolulu (Hawaii) ‡v Pictorial works. 692 1 4 ‡a Mellon, Paul ‡x Bookplate. 700 1 ‡a Burgess, George Henry, ‡d 1831-1905. 710 2 ‡a Britton & Rey.